Even in science fiction, supposedly the genre of limitless possibility, where everyone is invited to the adventure, heterosexual, heteroromantic, and cisgendered are considered the default, to the extent that everything else is "deviation," and must be eyed with suspicion. 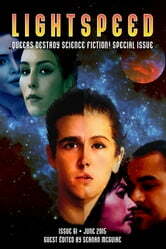 LIGHTSPEED was founded on the core idea that all science fiction is real science fiction. The whole point of this magazine is that science fiction is vast. It is inclusive. Science fiction is about people, and queer people, no matter how they identify [Gay, lesbian, bisexual, demisexual, asexual, pansexual, intersex, transgender, genderfluid, genderqueer--anyone who fits within the QUILTBAG], are a big part of that. They always have been. They're just sometimes harder to see. So, in the interests of visibility and breaking stuff, Queers Destroy Science Fiction! will show you just how wide the spectrum of sexuality and gender identity can really be.